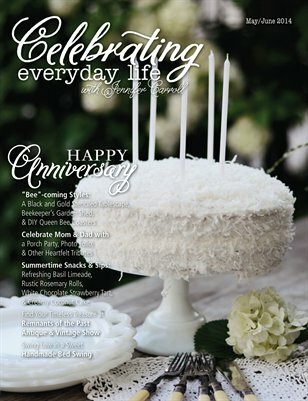 Welcome to our first anniversary edition! This 150-page issue is brimming with ideas on celebrating family and making memories with your loved ones all season long. There are whimsical ideas for bee-lovers including stepping inside a bee-themed gardening retreat, setting a bee-themed table, plus we discover enchanting products sporting the iconic bee motif. Explore beautiful rooms that you will want to linger in, sample delicious recipes and try your hand at creative DIYs that will help you transform your home and yard. Plus, we sit down for an inspiring interview with Judy Watkins, the Queen Bee of the beloved vintage show “Remnants of the Past” in California and much, much more!